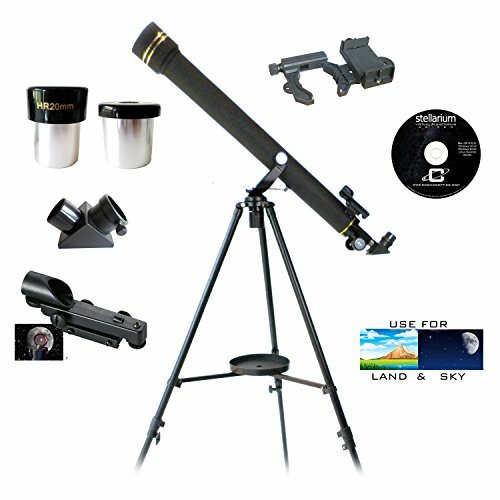 This Galileo SS-760 700mm x 60mm Refractor Telescope and Galileo G-SPA Smartphone adapter kit lets you use the camera feature on your smartphone to take pictures or video through the optics of your telescope, or use your smartphone to assist navigating your telescope view to your celestial object of interest. Finding your target is easy with its Altitude Azimuth yoke mount featuring a slow motion altitude adjustment rod for precision adjustments, attached to a very sturdy, fully adjustable, pre-assembled metal tripod with retractable rubber feet. Terrestrial viewing and photography is possible as well with the included 45° erect image prism which produces a totally erect image. The Galileo SS-760 optical tube assembly features a 700mm focal length. The objective lens is a 60mm two element achromat, fully multi-coated air spaced objective lens. The tube itself is aluminum, painted flat black internally, and fully baffled for excellent visual and CCD imaging. The finderscope is Galileo's Mars' Eye electronic Finderscope which helps by getting the observer behind the telescope without losing the surrounding field of view when targeting objects. Also included with the SS-760 are a 1¼″ 6mm eyepiece (116X Power/Magnification) and a 1¼″ 20mm eyepiece (35X Power/Magnification). As well as mounting to the telescope, the Galileo G-SPA Smartphone adapter lets you use the camera feature on your smartphone to take pictures or video through the optics of your binoculars, spotting scope, microscope etc. as well. It also allows you to mount your Smartphone on a standard camera tripod for hands-free video calls, family photos with everyone in the picture, or anytime you want to include yourself in the action. Fits most popular smartphones.